Dysfunction Junction chronicles the most forlorn, baffling, and wonderful crossroads of our fair city. Ben Ball is a transportation nerd in his spare time. He lives in LeDroit Park. Ben previously wrote about 14th and Park/Kenyon NW. It’s simple: this intersection is over capacity. Wisconsin is the big north-south thoroughfare, and M is the big east-west thoroughfare, but neither can deal with the jam of drivers, pedestrians and daring cyclists who just want to get where they’re going. Naturally, the place where they meet just compounds the lunacy. The sidewalks here are already legendary for their narrowness. Most of the time, it just feels like the line for Georgetown Cupcake metastasized over the whole neighborhood. Garbage cans and parking meters further promote the sense that you’re running an obstacle course. 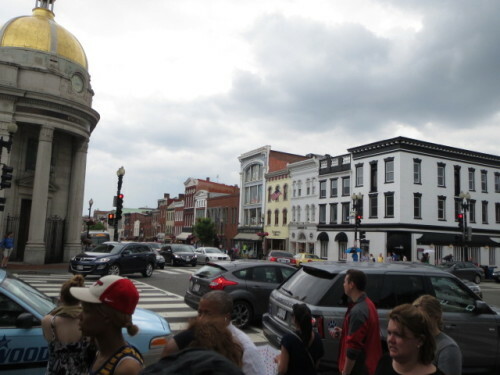 Then the crowd of people looking to cross the street turns this intersection into a giant game of red rover, thwarting those who just want to go around the corner. Every light change starts the Mexican standoff between entitled pedestrians, harried drivers looking to turn right, and left-turning drivers stuck in the middle of the intersection. If it was just about shoppers, traffic wouldn’t be so bad. But this intersection is actually a double bottleneck. 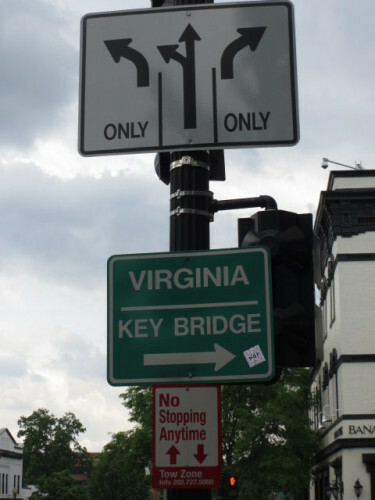 Virginia drivers just want to get to the Key Bridge. Folks from Glover Park and points north just want to get downtown. Both must cross paths at this intersection. If you’re on a southeast-bound 30 bus, be prepared for a long ride. If you’re not on one, it might be a while. (The transit screens the Georgetown BID wants to install will at least allow us to sit in the cafés while we’re waiting.) Even emergency vehicles have a hard time getting through the logjam – I saw one sit there, sirens blaring, for a good five minutes this weekend. If we had truly visionary leadership, we would Big Dig this thing. Deep underground would be the start of a separated Blue Line. Above that (but still just under the surface) would be an arterial road to easily connect Rosslyn to downtown DC. 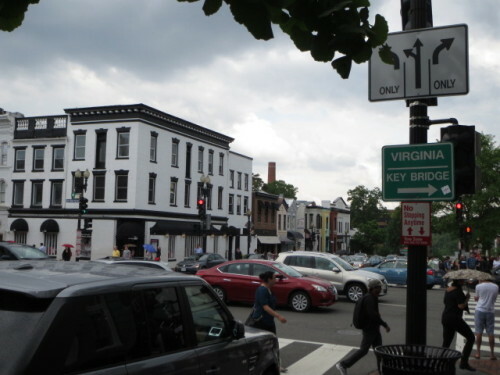 Up top, M Street could finally become the fully pedestrian walkway and streetcar corridor that it desperately needs to become. Bonus: we could finally tear down the Whitehurst Freeway, an idea already forty years in the making. But that’s all wishful thinking. We’ll be waiting quite a while for someone to conjure up the cojones (and the cash) to fix this mess permanently.